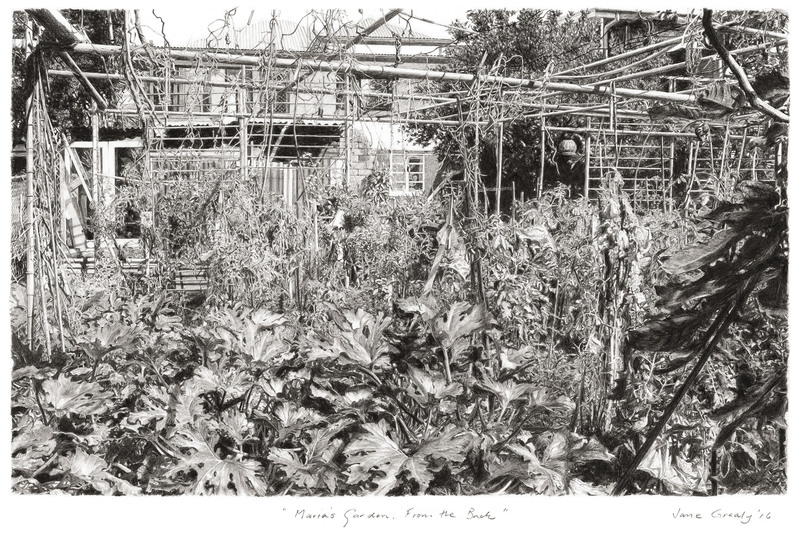 “Maria’s Garden, From The Back” recently won the Art Spectrum People’s Choice Award and was acquired by the Grafton Regional Gallery. “This detailed drawing won the popularity stakes hands down. Any time you were in the gallery when the 2016 JADA was on display there are visitors standing in front of this drawing of the artist’s neighbour’s garden” Jude McBean, Grafton Regional Gallery Director. The fourth in this series, “Maria’s Garden, From the Back” is of my neighbour’s garden, with its history of Maria’s long marriage, her love of gardening and Italian post war migration in our inner city suburb of New Farm in Brisbane. The 2016 Jacaranda Acquisitive Drawing Award has gone to Caboolture Regional Gallery for the first of its eight venue tour. The winner and four acquisitions along with the 41 finalists are set to tour until August 2018. After Caboolture Regional Art Gallery the 2016 JADA goes to University of the Sunshine Coast Gallery followed by Bundaberg Regional Art Gallery, Gympie Regional Gallery, Redland Art Gallery, Coffs Harbour Regional Gallery, Warwick Art Gallery and the New England Regional Art Museum, Armidale.